Bring bold elegance to your look with this stunning 'Parker' watch from Michael Kors. The watch is crafted from stainless steel with a striking yellow gold finish that beautifully complements the crystal-encrusted bezel and the champagne-tone watch face. The dial features a date display window, three subdials, sparkling crystal hour markers, and Arabic numeral and stick indices along the inner rim for added precision. The sparkling, quartx movement timepiece secures with a goldtone link bracelet. They sent me replica of Michael Kors watch. Packaging of the watch made me dubious about the authenticity of the product and I went personally to a showroom to see the watch and packaging itself. Pics uploaded for anyone who wants to buy from them and authenticity checks; First pic close up of watches; - In the authentic watch, date window will always be centered and 24hrs clock will work fine Second pic packaging; - pillow of authentic watch will have cardboard type material on the sides - manual comes with authentic watch will be thinner than fake - in authentic packaging, on the edge of lower box 'Michael Kors' will be written - upper box (box cover) will be long in hte authentic packaging. This was my second Michael Kors watch from Overstock and I'm highly satisfied. Great quality and warranty. Love this watch! 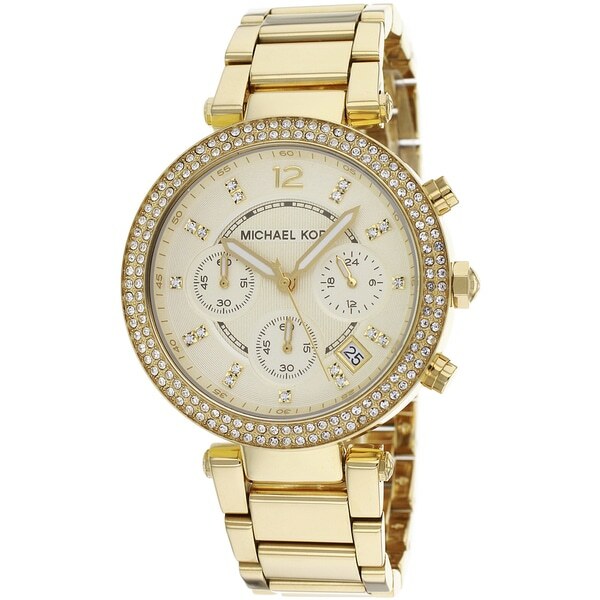 Shopped all kinds of sites to compare pricing and Overstock was one of the best places to buy this Michael Kors watch. The band was too long but it took a local jeweler a couple of minutes to pop off the pieces and fit it to my wrist. Beautiful piece! I didn't receive sizing links or serial number packaging that comes with authentic Michael Kors watches. LOVE this watch! It’s absolutely beautiful! Love the big face and the gold color. Really is a statement piece and very classy. Love the diamonds around the face too. Definitely a must! The watch is good quality, shipping was fast and I will definitely recommend this as an everyday watch. Very elegant Watch for the price. Good quality watch. I would recommend this even after 2 years. The price is just right, I bought this for a friend a while ago and she was overwhelmed. This watch is very attractive and I would recommend it to any friend that wanted an oversized watch. A really beautiful watch. It is fun and sparkly, and I get positive compliments every time I wear it! The face is big, but not overwhelming, and I'm a relatively small person. Beautiful watch and very happy with my shopping experience. Would definitely recommend. Beautiful watch but it’s a shame it dosent bring xtra links. They don’t have different sizes. My wife wants one and it looked like a good buy compared to other sites I looked at. "Is it real or authentic Michael Kors?" Hello Ray, yes, this is authentic. Thanks for shopping with us! "what model year is this watch"
Hello ab, this style was first produced in year 2010. Thank you for shopping with us.